A mighty wind is blowing Uptown this June and it will bring wins and Free Spins your way! 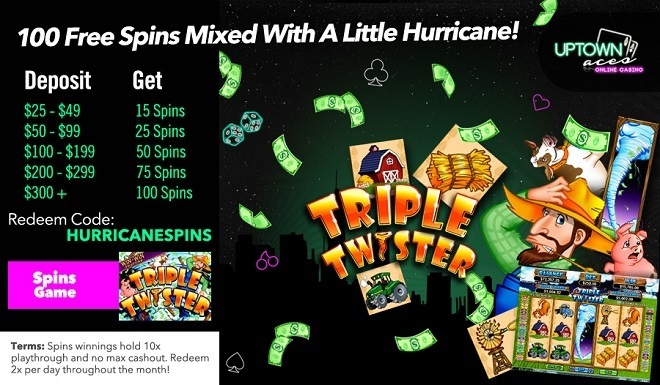 Deposit $25 and up and you’ll be spinning the reels of Triple Twister with a maximum of 100 Free Spins! Trigger the Win-Win Feature when your win from free games totals to 10 times your triggering wager. If you don't cash in during the free spins round, the Win-Win Feature will help you amass wins with 100 times your bet amount! Catch what the wind is throwing your way this June: wins and Free Spins!